Upcycling. A word most have heard of, but few have put into practice. So what exactly is upcycling? Isn’t it just another form of recycling? The answer might surprise you. Upcycling is the process of taking something old or seemingly useless, and turning it into something useful again—giving new life to an item that is otherwise destined for the trash can or recycling bin. The difference between upcycling and recycling lies in the end result. Recycling is the process of taking an item and breaking it down to an unrecognizable state that can then be used in a new item, such as taking the aluminum from an old bike, and breaking it down to be used in soda cans. Upcycling on the other hand, repurposes an item so that its original state is still intact, like converting an empty wine bottle into a lovely vase to hold your flowers. The end product ultimately gives new life to the bottle itself rather than transforming it into something unrecognizable from its original state. Upcycling is not a new concept, but does seem to be getting trendier by the day mainly due to the fact that it is a great way to live ‘green’. With Earth Day coming up on April 22nd, what better time to test out your upcycling skills? Earth Day reminds us all how important it is to protect our planet from unnecessary waste, and upcycling is a fun and easy way to do just that! After all, we only have one Earth to call home, and we need to preserve it. 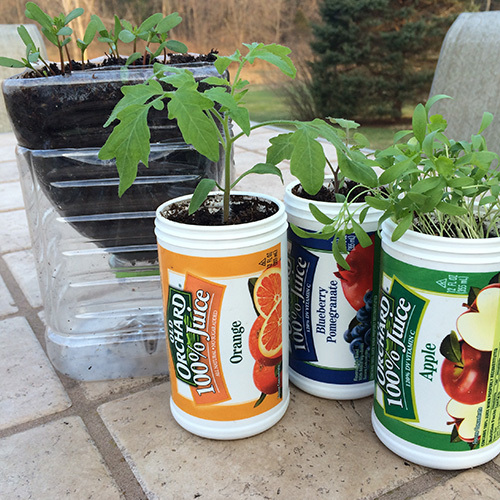 For this reason Old Orchard is challenging you, yes YOU, to take your empty Old Orchard juice containers and transform them into something new. Turn old caps into magnets for the refrigerator, cut the plastic bottle in half and use it as a pot to hold your plants or even transform the frozen juice can into a pair of binoculars. The possibilities are endless and the feeling you will have knowing you made a difference is priceless. Enter our Grow Your Own Sweepstakes for your chance to win FREE Juice and a FREE Herb Mix Seedling Packet!